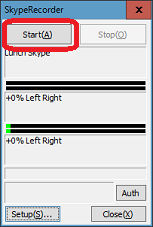 Double click SkypeRecorder icon on the desktop. 2.Open [Control window] from tasktray. Double click a blue icon on the tasktray. Output path...Recording file output folder. CODEC...Video CODEC. Choose [Microsoft Video 1] for now. Device1 and Device2...Choose a microphone and a speaker same as Skype. Close...Save and Close this window. 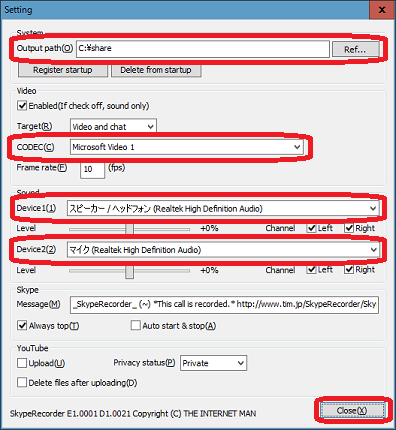 When you start to call on Skype, it is recorded automatically. SkypeRecorder merges video and audio files after recording. After that you can watch the video file on Windows Media Player.